For a few months, we have had a new feature here to allow readers to report problems across the area. People have reported graffiti, dead animals in the roadway, missing signs and more. With the two recent snows and the freeze-thaw cycles, potholes will become a major problem in Anne Arundel County and Annapolis. Smart Cars will be eaten alive and gas guzzling SUVs will all be in the shop for alignments shortly. 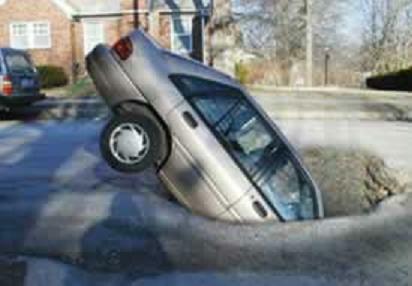 If you see a pothole, report it! Simply click on the WHAT’S YOUR PROBLEM? link at the top of the page and let everyone know about the big holes. These reports are forwarded to the proper authorities.